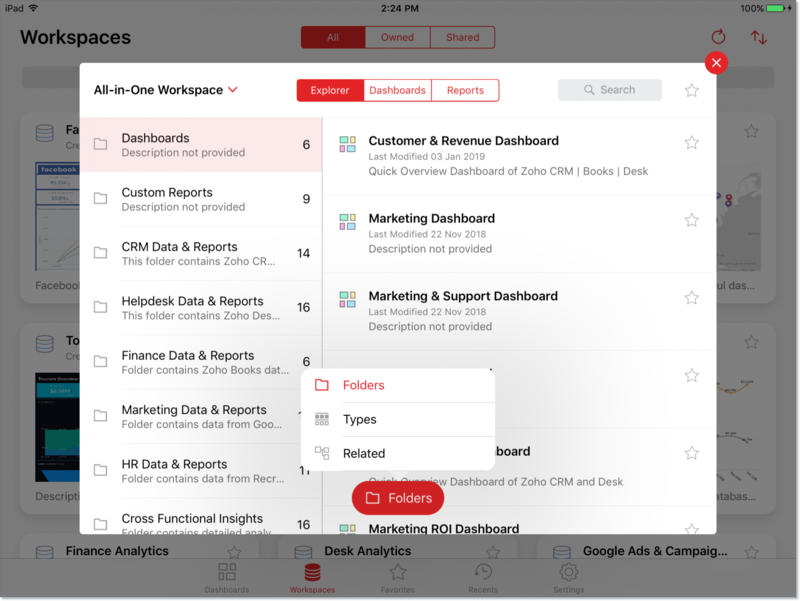 Zoho Analytics for iPad enables you to access your Zoho Analytics data from your iPad. This application is available for free from App Store and iTunes. With the Zoho Analytics app, you & your users can access the live reports & dashboards that you create in Zoho Analytics service. The app enables you to keep track of your key performance metrics and helps you take informed business decisions, while on-the-move. Easily access and traverse across your reports through visual previews, powerful search and a variety of view customization options. 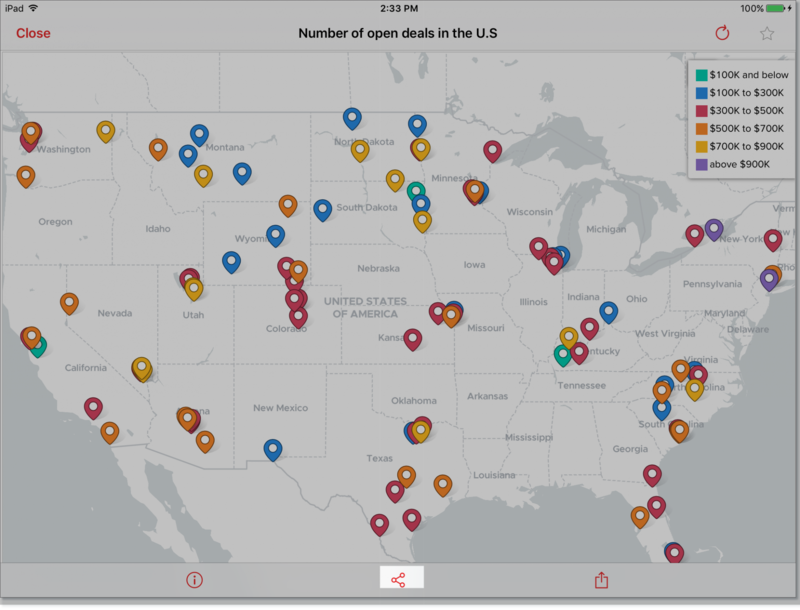 View the reports and dashboards that you have created. 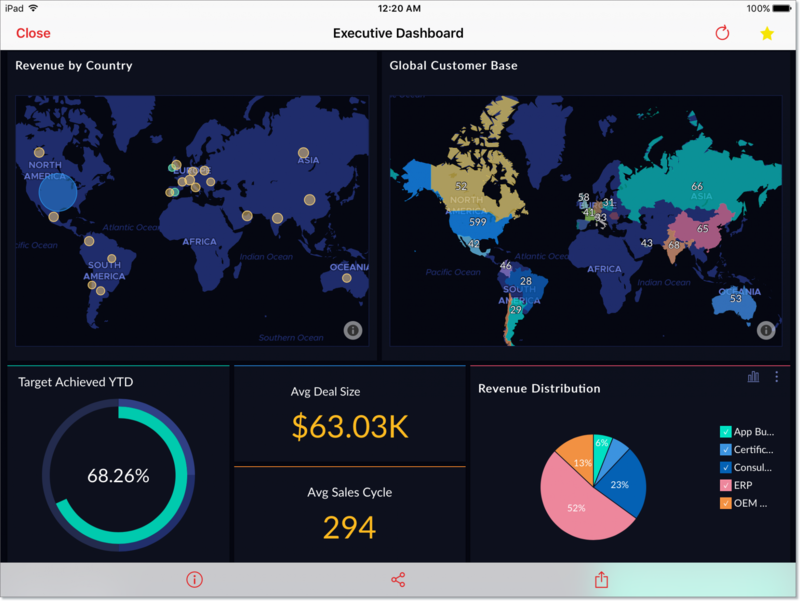 Interact and explore reports through an immersive touch experience through actions like drill down, user filters, view underlying data and much more. Bookmark important Views as Favorites. Collaborate with your colleagues by sharing Views. Export Views into various formats. A Zoho Analytics account (including free version), internet connectivity (cellular or Wi-Fi connection). You can access this from the App Store app in iPad. Search for Zoho Analytics in the App Store. Tap Zoho Analytics in the product Info screen. Tap Get. The application will be automatically installed. You will be prompted to login. Specify your Zoho Analytics' credentials. On successful authentication, your Zoho Analytics Workspaces will be downloaded. Open your iTunes application on your desktop. In iTunes, search for Zoho Analytics. 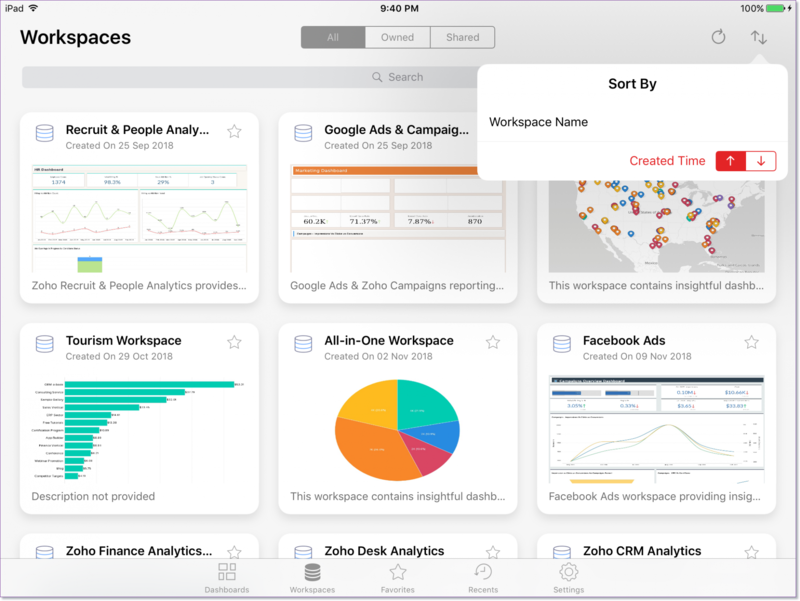 Download the Zoho Analytics app from iTunes. Connect your iPad to your computer and synchronize. You will be prompted to login. Specify your Zoho Analytics' credentials. On successful authentication, your Zoho Analytics data will be downloaded. Using the Zoho Analytics application, you can view, interact and collaborate on your reports and dashboards on-the-go. In this section, we will learn about accessing workspace, reports and dashboards. It is mandatory to get connected to the Internet to access the reports. When offline, you can only view the Workspaces and Views list. You cannot open any of the actual reports. Zoho Analytics App's Home page lists all the Dashboards that you have access to (including the ones shared to you) are listed in the Dashboards tab of the Home page. 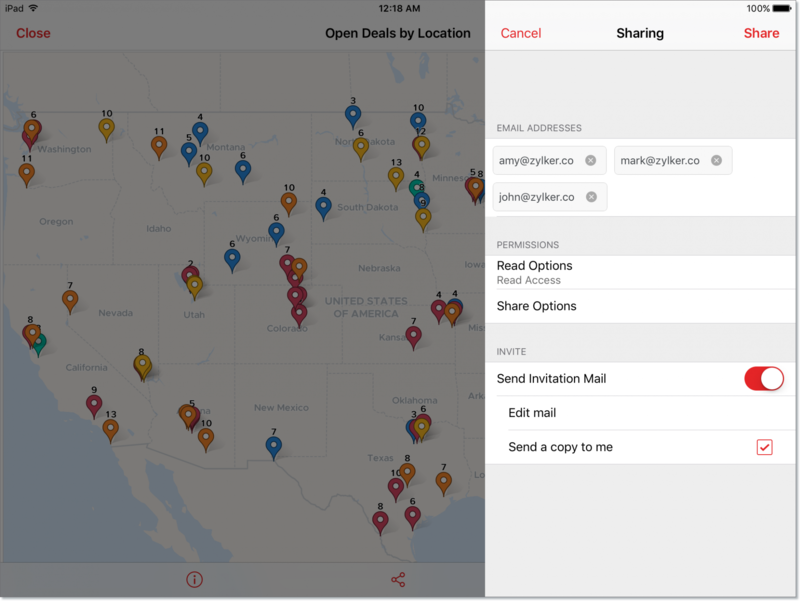 You can choose to view the Dashboards that are created by you or shared to you, by navigating to the corresponding tabs. You can also choose to list the Dashboards in a specific Workspace by selecting the applicable Workspace from the All Workspaces drop down. At the bottom of the page, you will find the below option for easily navigating to other views. Dashboard - Lists All the Dashboards that you have access to. Workspaces - Lists All the Workspaces that you have access to. Favorites - Lists the Views that are marked a Favorite. Recents - Lists the Views recently viewed items. Name - This sorts the Views by name. Last Modified - This sorts the Views by last modified time. Created On - This sorts the Workspaces by created time. Tap the Workspace that you want to open. All the Views in the Workspace will be listed in the Explorer page. Zoho Analytics allows you to specify how to organize the views in the following order. Folders - The views will be organized by folders they are saved. Related - All views related to a table will be organized together. Further, for easy accessibility, the analytics elements are organized into two more tabs: Dashboards and Reports. You can access the chart in read-only mode with the following interactive options. 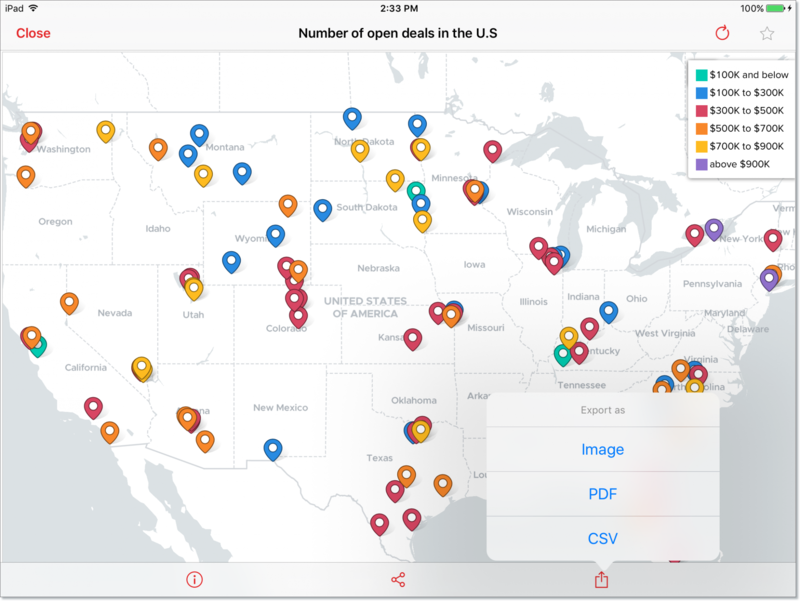 Tooltip - You can view the chart tooltip by tapping the corresponding data point. View Underlying Data - You can view the underlying data of a data point by double tapping on the data point and then by selecting View Underlying Data. Drill Down - You can drill-down at any data point by double tapping it. Select the drill down option. You can navigate across the drill down path that has already been set for the chart or search the columns by which you wish to drill down the data. The drill down path will be displayed as a breadcrumb at the top the chart. Legend - Using the Legend option you can dynamically filter the data series in a chart by selecting/deselecting the corresponding legend item. Dynamic User Filters - You can dynamically filter the reports using the User Filters created in the report. You can access the tabular views in read-only mode with the following interactive options. 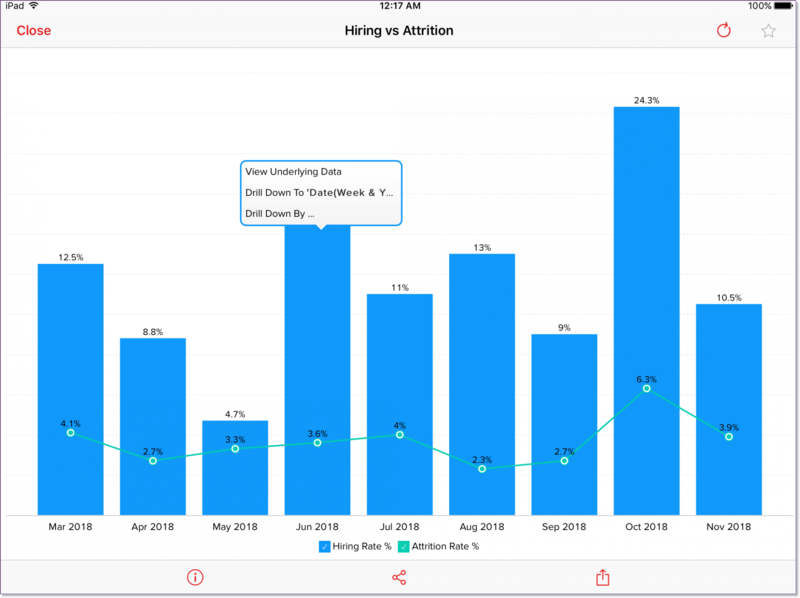 View Underlying Data - You can view the underlying data of a data point by double tapping on the data point and then by selecting View Underlying Data. The drill down path will be displayed as a breadcrumb at the top the view. Sorting - On tapping the header you will see a sorting icon which can be used to sort the column in the desired order. The up arrow indicates sorting in descending order and the down arrow indicates sorting in ascending order. 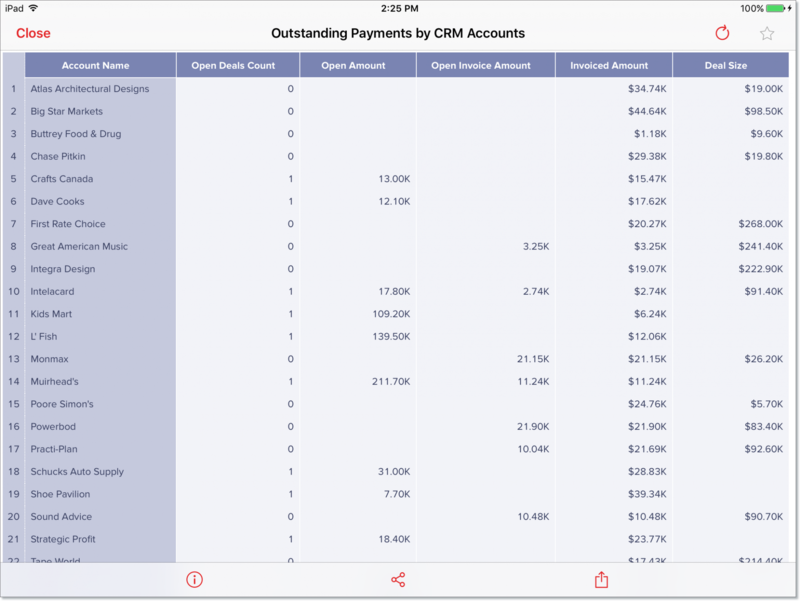 Navigation - You can navigate across the table by swiping through the rows. You can also navigate to the top and bottom of the table using the navigation bar displayed at the bottom right. You can access the dashboard as you view in the service. All the interaction of the embedded views will be supported. 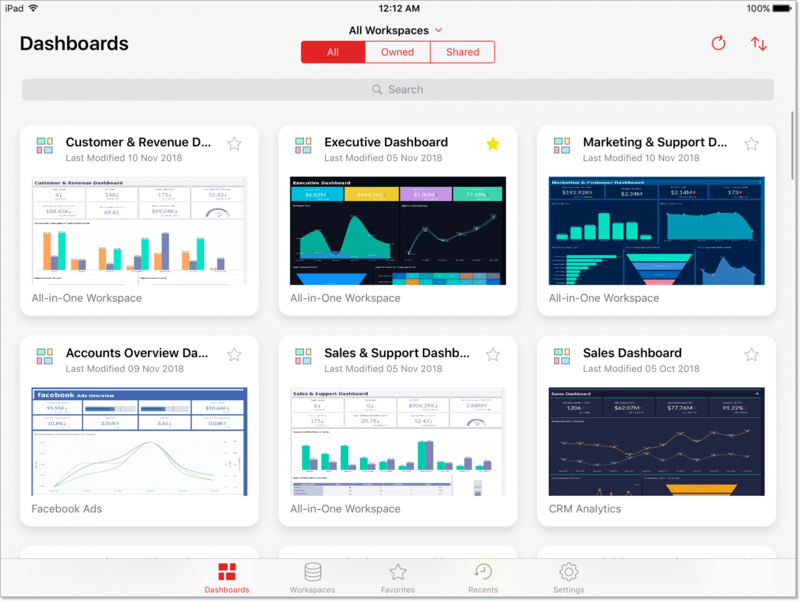 You can collaborate with your users or colleagues by sharing your reports and dashboards as required from your iPad. The Sharing screen will open. Specify the email address of the users with whom you wish to share in the Email addresses field. Set the necessary permissions to be granted for the view. For more details on the granting permissions, refer to the Granting Permission section. You can customize the email to be sent by tapping the Edit mail option. Select the Send me a copy to send a copy of invite mail to you. Tap Share. The view will be shared to your user. You can export a copy of the view to access them offline or share it with non-Zoho Analytics user. The supported formats will be listed. Tap on the required format. Options to store the exported view will open. You can either choose to save it in your device using Upload to Photos, Save to Drive etc., or share it with other using Whatup, messaging or Gmail. The following are the supported export formats. Zoho Analytics always values your privacy and data security. Hence, we provide the following security options. Zoho Analytics allows you to lock the app. This restricts anyone who has access to your mobile access to your data in Zoho Analytics. Follow the below steps to lock the app with a PIN. 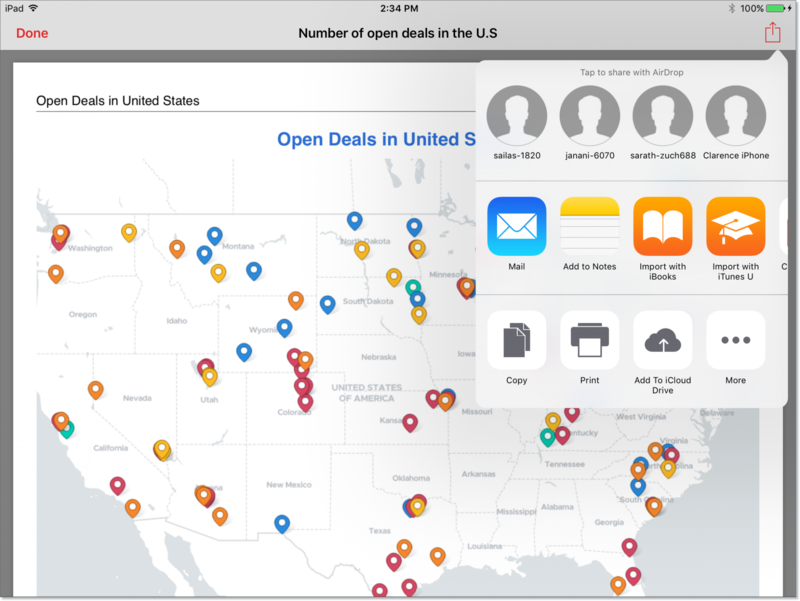 Open the Zoho Analytics App. Tap the Settings icon. The Settings page will open. 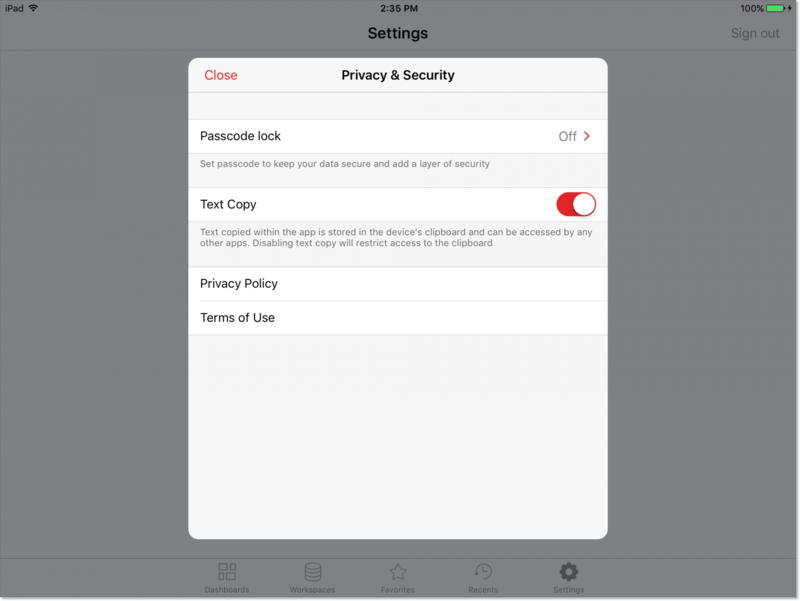 Tap the Privacy and Security Setting. Tap Passcode Lock. The App Lock page will open. Tap Turn App Lock On. Enter the PIN. The PIN to open the App will be set. You can set when to prompt enter PIN in the Ask for Pin section. Available options are. 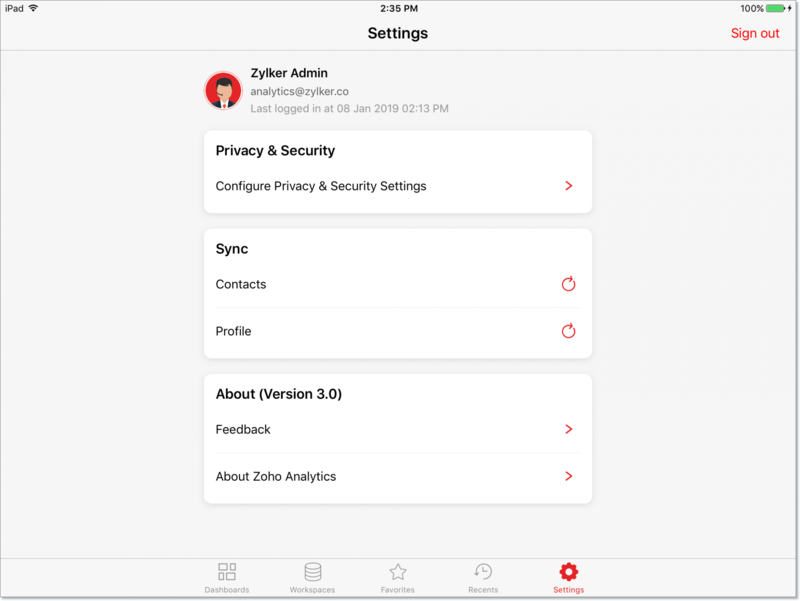 Now the Zoho Analytics App is secured. 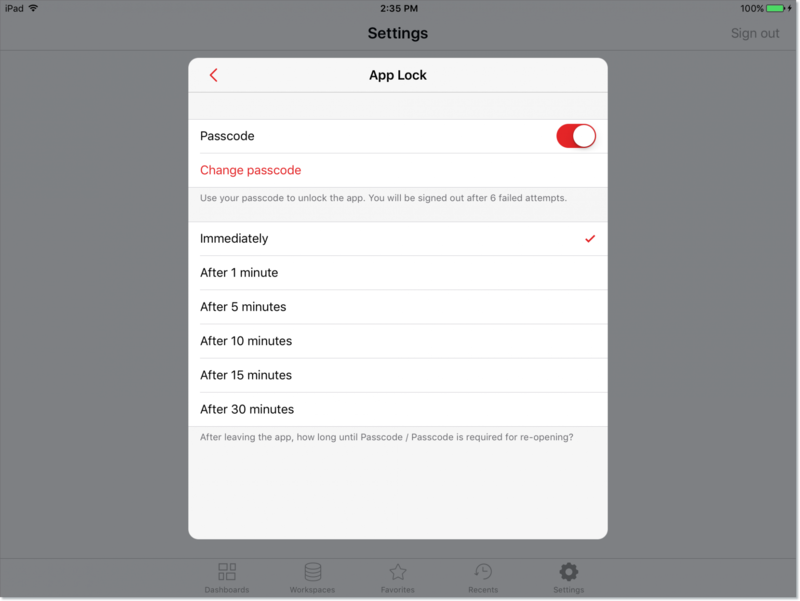 You can Turn Passcode off or Change Passcodeanytime. When you turn on the app lock, you will be signed out after six consecutive failed PIN attempts. Text copied in from Zoho Analytics app will be stored in the device's clipboard. These copied content can be accessed by other applications in your device. Zoho Analytic allows you to disable this behavior. Follow the below steps to restrict access to clipboard data. Open the Security page of the App. Turn off the Copy Text toggle button.